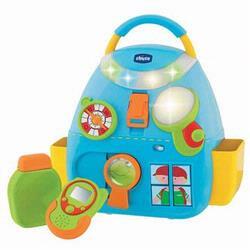 A fun filled activity center with music, sounds and lights. Press the orange button to listen to the fun music or activate the melodies by playing with the magnifying glass. The compass spins around, the torch lights up and the puzzle makes 3 different characters.Comes complete with walkie talkie and water bottle. The backpack can also be pulled along.